Cor-Pak® VpCITM Stretch Film is the ultimate high performance film, developed for corrosion protection of ferrous and non-ferrous metals. This film is coextruded using state-of-the-art resins, which offer superior strength and stretch characteristics as well as multi-metal corrosion inhibiting properties that only VpCI technology can deliver. Cor-Pak® VpCITM Stretch Film delivers puncture resistance and load holding, which allows a user to down-gauge, contain aggressive loads and produce a better package at reduced cost. 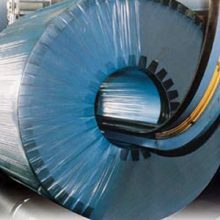 The combination of enhanced polyethylene resins with VpCITM technology makes Cor-Pak® VpCITM Stretch Film the most advanced corrosion inhibiting stretch film available today on the market.